Mariners GM Jack Zduriencik hasn't yet made the big move everyone is expecting as his team slips a bit in the standings. The Mariners already have completed one trade, acquiring designated hitter Kendrys Morales from the Twins last week. 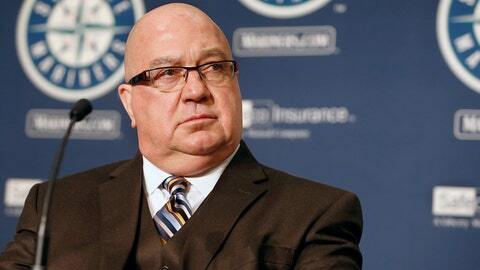 General manager Jack Zduriencik could make one or two more deals before the non-waiver deadline Thursday at 4 p.m. ET, maybe even a blockbuster. To hear rival executives tell it, though, Zduriencik mostly has exasperated trade partners with his negotiating style while trying to guide the M’s to the postseason for the first time since 2001. Those executives say the Mariners frequently inquire on a number of players, only to shift direction when a deal appears within reach. Such conduct is not unusual for teams navigating the complex trade market. But in numerous conversations, executives from other teams have singled out Zduriencik as one of the most difficult GMs in the sport with whom to do business. Zdurincik’s peers express frustration with his methods – and their complaints are not new. The rival executives spoke on condition of anonymity because of tampering rules and the ongoing nature of trade conversations. And while Zduriencik is free to conduct business however he sees fit, his peers say the trade market is clogged in part due to the Mariners’ stalled pursuits of players such as the Rays’ David Price, Rangers’ Alex Rios and Phillies’ Marlon Byrd. Meanwhile, the situation is turning urgent for the Mariners, who are 3-7 since the All-Star break and now just three games above .500. Zduriencik, who reportedly is unsigned beyond 2014, also is in a delicate spot. The M’s went 85-77 in ’09, his first season, then produced losing records in each of the past four years. Some GMs turn aggressive when their jobs seemingly are at stake. Zduriencik, on the other hand, baffles rival executives with his inability to close deals. Zduriencik, in a lengthy E-mail to FOX Sports, responded by saying that the in-and-out nature of his trade conversations are typical of those that occur throughout the industry. “There are many discussions that take place throughout the year, and I am open in my dialogue and intent,” Zduriencik said. “I have not had an offer on the table and pulled it back. I have been clear in my discussions and often express my intentions. “I have done enough deals, signed enough players in my history, that this alone should speak to this subject. Inquiries, discussions, dialogue, and even the exchange of names does not mean a deal will get done, and all GMs realize this. Many times there are varying points as names go in and out from both parties. There are so many factors that go into any trade that most clubs realize how hard and sensitive this subject can be. The Mariners are drawing increased attention from other clubs not only because of their emergence as a surprise contender but also because of their reservoir of young talent. Teams view Seattle as an attractive trading partner, and the M’s have an obvious need for offense – they lead the American League in ERA but are next-to-last in runs scored. The AL West title is all but out of reach for the Mariners, who trail the Athletics by 11 games, the Angels by 9½. The second wild card is a more realistic target – the M’s are a mere 1½ games behind the Blue Jays in that race. But the only assurance that a wild card offers is a one-game playoff, with the winner advancing to the best-of-five Division Series. Rival executives view even the one trade that Zduriencik has made thus far as curious. The Mariners not only gave up right-handed reliever Stephen Pryor for Morales but also agreed to pay the remainder of the approximately $4.33 million remaining on Morales’ contract. This for a player who was batting .234 with a .584 OPS – and since has gone 1-for-10 in his first three games with the Mariners. The trade did squelch the notion that the Mariners were operating without payroll flexibility – a notion Zduriencik himself perpetuated, rival executives say. The question now is whether Zduriencik can capitalize on that flexibility – and whether Mariners ownership is influencing the GM’s stop-and-start behavior. Former club officials have accused ownership of meddling in the past. Zduriencik, who took over as GM on Oct. 22, 2008, was an assertive deal-maker in his early years, completing a three-team, 12-player trade at his first winter meetings and acquiring left-hander Cliff Lee from the Phillies at his second. But he got a poor return for Lee from the Rangers the following July, then sent right-hander Doug Fister to the Tigers in another ill-conceived deal the next year. Since then, Zduriencik’s trades mostly have brought low-impact returns. Second baseman Robinson Cano, the Mariners’ biggest acquisition last offseason, was a $240 million free-agent signing. The team’s only trade of consequence was pitcher Carter Capps for first baseman Logan Morrison. Their only trade last July sent infielder Robert Andino to the Pirates for a player to be named. The next four days, then, could amount to the most significant test of Zduriencik’s tenure in Seattle. He will either defy the criticism of him within the industry or spark renewed questions about whether he is fit for the job.